Do you work with children who struggle with executive function skills? Some students can find it difficult to pay attention, stay focused, be organized, plan, self-monitor, self-regulate, or complete reading and writing assignments. These are all examples of executive function skills. When executive function deficits are present, students can become frustrated, disengaged and give up. 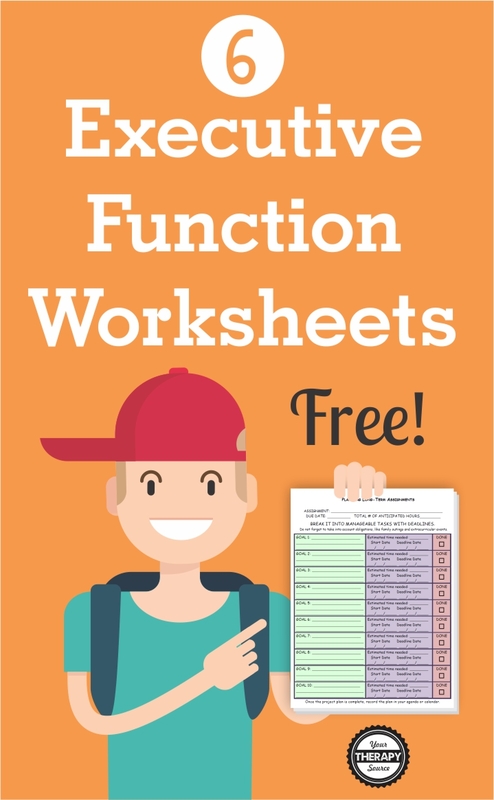 Here are 6 FREE executive functioning activity worksheets to help students succeed. You can download them all at the end of this post. The first executive functioning activity is for planning long-term assignments. Students can use this worksheet to break down large assignments into manageable tasks with deadlines. By documenting small goals, estimated time to complete each task and checkboxes to mark when done, students will be able to complete the large projects independently. This one page freebie offers reading strategies for textbooks in checkbox/list format. Strategies are listed for before reading, during reading and after reading. It is perfect for folding it in half and tucking inside the textbook to refer to while reading. This freebie includes 2 sample writing organizers. There is a middle school accordion organizer that includes the framework for the introduction, the body and the conclusion. The high school organizer breaks down how to write the conclusion. The grade tracker helps students stay on top of their grades in different subjects to encourage motivation and to recognize what areas need improvement. The final freebie in the packet includes sample planner sheets. The first 2 planner example pages include assignment requirements, after-school plan, Do Not Forget list, to-do list and weekend study plan. The third planner example page includes goals, reminders, homework, academic grades, gratitude reflection and more! 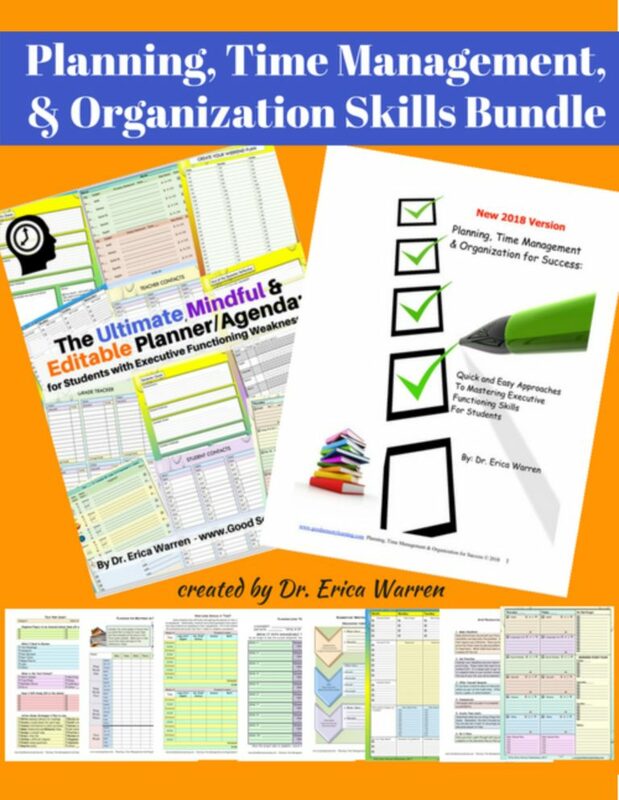 This entire freebie PDF packet is from the Planning, Time Management, and Organization Skills Bundle. This digital download was created by Dr. Erica Warren, a learning specialist and educational therapist will help students master executive functioning skills. This 168 page, digital download bundle offers quick and easy approaches/handouts to mastering executive functioning skills for students. The areas of focus are planning out assignments, discovering one’s best organizational approach, study strategies, memory strategies, test prep, breaking down long-term assignments, behavior modification materials, calendars, agendas, developing active learning, writing strategies, reading strategies, and math assistance and more. Teachers, therapists, and parents can teach students using this amazing resource to use schedules, individualized agendas, templates and more to help with executive function skills. FIND OUT MORE. 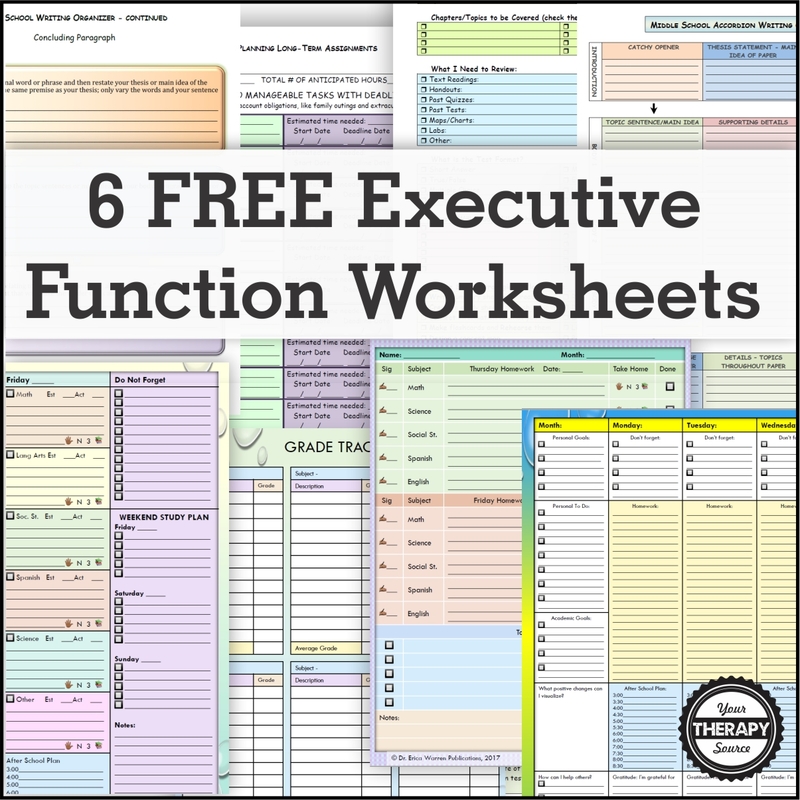 Get your 6 FREE Executive Functioning Worksheets here. Sign up to receive the weekly email newsletter and announcements from Your Therapy Source. You will be redirected to the download. If you are already a subscriber, please still enter your email to access the download.